120 x 500mg UltraCür Curcumin-Whey Complex Capsules. This stuff WORKS amazingly well! ULTRACÜR® is a revolution in Curcumin - UltraBioavailable - UltraPotent - Fast Acting. Up to 15,000 times more potent than standard Curcumin & 10 times the bioavailability of nano-particle preparations. Fast acting - peak plasma levels in as little as 20 - 40 minutes. 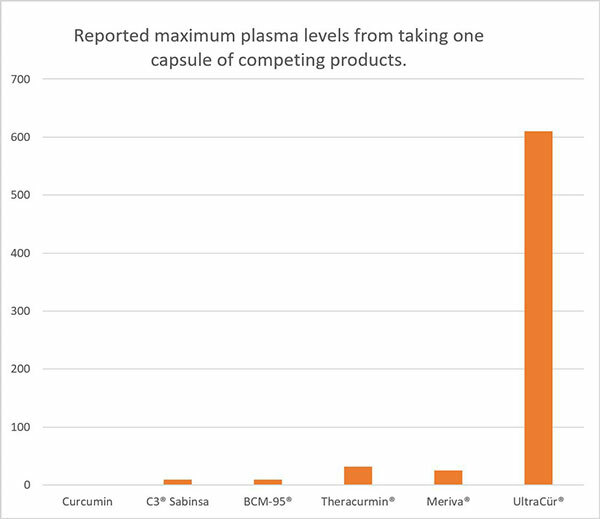 1 capsule provides on average 610ng/ml plasma concentrations at peak. 610ng/ml would take approximately 190 regular Curcumin capsules to achieve the same result. Ease of Digestion - quickly disperses in water. 120 x 500mg UltraCür Curcumin-Whey Complex Capsules providing an easily absorbable curcumin derived from 95% pure curcumin solids. Taking UltraCur to support chronic or acute health issues: 2 capsules twice a day is typically sufficient. Taking UltraCur to support optimal health: 1 capsule twice a day is typically sufficient. We suggest UltraCur be taken on an empty stomach though it may be taken with food. UltraCur peaks in the blood stream between 20-40 minutes and stays in the bloodstream for 8-12 hours. Take a 2 day "Curcumin Holiday" every month so as not to acclimate to UltraCur. Up to 10 capsules (2 five times a day) are recommended by Health Professionals. 100% Natural - uses no fillers or artificial materials. The capsule is Organic and all of the ingredients are made from Nature. FRANK L. on 28/Oct/2018 Expensive but really works. Best curcumin I've tried. John v. on 06/Aug/2018 I have been using Ultracur for three months. I am training heavily for a martial arts grading at the end of the year and there is no doubt that 4 caps a day helps my body recover quicker between trainings. Ultracur worked straight away and I received the benefits on day one of taking it. Geoff D. on 10/Jul/2018 For those looking for a very high daily dosage of curcumin, you’ve found it in this product. Robin A. on 05/Jul/2018 Am having great results with the above product which am taking to reduce inflammation in my knees. Thank you for the prompt professional service. Lori M. on 10/Mar/2018 So far, so great! Feeling the difference already! Russell C. on 17/Oct/2017 Much better anti inflammatory than the supplement we directed our clients to buy at whole Foods . 5-star! Rita P. on 27/Jun/2017 As per your recommended dosage I have seen a decrease in my stiff and aching joints. Thank you for always answering my questions. Your response time is excellent. Bryan A. on 12/Jun/2017 This seems to be a superior product, in that it is more readily absorbed into the body, and much more easily utilized in combating illness. However, we as yet have not down our blood analysis to detect its presence in the patient who is using this product. More later as we progress in our watchful testing and monitoring of this patient. It works fabulously with my arthritis. Pain has disappeared. Best thing I have ever tried. Highly recommended. UltraCur supports normal inflammation in the body. Tony C. on 28/Dec/2016 Probably the best Curcumin supplement available. Top specifications. Curcumin is able to exert anti-inflammatory, antiplatelet, antioxidative, hepatoprotective and antitumor activities, particularly against cancers of the liver, skin, pancreas, prostate, ovary, lung and head neck, as well as having a positive effect in the treatment of arthritis. Donatella Perrone, Fatima Ardito, Giovanni Giannatempo, Mario Dioguardi, Giuseppe Troiano, Lucio Lo Russo, Alfredo De Lillo, Luigi Laino and Lorenzo Lo Muzio.